Like the cryptic warning etched on the stone left behind by the mythical spokes-creature of the forest the Lorax (Danny DeVito), "Unless" becomes a sort of caveat for watching and ultimately enjoying the latest animated adaptation of Dr. Seuss's classic cautionary fable about the clash between corporate greed and Mother Nature. "Unless" you do mind a rather heavy-handed and somewhat pandering message about our at-risk natural environment and our constant desire for frivolous material things, then the film from Illumination Entertainment is sure to please. "Unless" you can't stomach loud, highly-elaborate musical numbers that seem to happen randomly with little cause behind them, then 'The Lorax' is for you. "Unless" you can't laugh at the kind of humor aimed at the youngest members in the audience, you're sure to do more than feign a smile. And "Unless" you can overlook the one blatant, contradictory aspect to the whole endeavor, then this otherwise well-intentioned family film has a great deal to offer. The list may look like a few too many stipulations for watching this over-zealously colorful and enthusiastically vibrant CG animated feature, but it really only applies to the adults sitting through the 86-minute film with their kids. The target audience will undoubtedly not notice or perhaps even care about the above mentioned. They'll be too busy being hypnotized by the sparkling, psychedelic colors and the remarkably detailed animation work done by the same folks who brought us the surprisingly delightful 'Despicable Me.' There are times when things get somewhat dark and hairy, mostly in sequences when traveling through a treeless countryside, but the silly laughs continue amongst the gloom, keeping everything upbeat and buoyant. The same goes for the script by Ken Daurio and Cinco Paul (they previously worked together for another Seuss adaptation in 'Horton Hears a Who! '), countering a bit of weighty seriousness not actually found in the original book with some situational comedy that works thanks to Betty White as grandma. Again, for younger viewers, the colors, animation and goofy jokes are enough to entertain while directing team Chris Renaud and Kyle Balda (the latter of which moves up from Pixar animator) deliver their always worthwhile message about our dying eco-system and the importance of conservationism. As far as I'm concerned, there is no arguing with what the filmmakers are trying to do and no doubt, they'll likely encourage many of the kiddies to plant more trees. The 12-year-old Ted (Zac Efron) is a likeable pre-teen who commences his search for a tree as a means to impress his next-door crush, Audrey (Taylor Swift). Upon listening to the story of the Once-ler (Ed Helms), he realizes the natural environment is also in need of someone who cares. Although several characters are new additions to the original tale, Theodor Seuss Geisel's prophetic message about the ravenous consumer industry remains at the heart of it all. And successfully delivering such a moral with the kind of wild-eye relish and imaginative zaniness to entertain children is admirable in and of itself. For the grown-ups (you can take that to mean parents forced into watching this), the filmmakers try to include several cultural references which are neither particularly comical nor clever, and I doubt anyone under the PG-13 crowd will actually catch on to them. On the other hand, they do provide some level amusement and make the film that more bearable to sit through. The idea of an artificial town constructed entirely of plastic and many other synthetics plays a strangely ominous role when looking around my house and seeing precisely at what the story is hinting at. The bullying speech about youngsters not caring for nature when they have countless other electronic distractions to occupy them could go over the heads of some of the very young, but the adults can smile at the astute jab. It's even more amusing when it comes from the short megalomaniac mayor and sniveling businessman, Aloysius O'Hare (Rob Riggle), who finds trees threatening to his business of bottled oxygen. What I found most ingenious, however, is the residents of Thneed-Ville gladly walling themselves inside their fabricated city, a metaphor for the blissful ignorance of the damage and deconstruction consumerism can bring upon the environment. Unfortunately, this well-intentioned moral, which definitely bears repeating in our modern consumer, heavily co-dependent society, is eventually lost in a product whose success is not-so ironically reliant on the very behavior it preaches against. This is made all the more problematic when holding said product in my hand, manufactured from the same synthetic plastics as Thneed-Ville and requiring who-knows how many trees to be chopped down in order to decorate it. Of course, the adults are likely to catch on to these contradictions and therefore, will become a matter of importance only to them. The children, to whom this movie is obviously geared towards, will probably not even notice, preoccupied more by all the pretty colors and the dazzling animation. They will also come out with a great appreciation for the environment, motivated perhaps also to plant a tree and participate with other conservationist efforts. Not only do I like such activist messaging, but I can also stand behind it wholeheartedly. Sadly, it comes at the expense of a somewhat guilty conscience and doing precisely the opposite of Dr. Seuss's wonderfully prophetic book. Universal Studios Home Entertainment brings 'Dr. 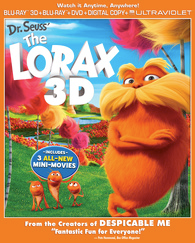 Seuss's The Lorax' to Blu-ray 3D as a three-disc combo pack with an UltraViolet digital copy. The two Region Free, BD50 discs sit comfortably on a flipper panel opposite a DVD-9 copy of the movie. The package also comes with a glossy, nicely embossed slipcover and several paper advertisements inside. After several skippable commercials and a couple trailers, viewers are greeted with a colorfully animated main menu screen with the normal options and music. 'The Lorax' makes his way to 3D Blu-ray with a demo quality 1080p/MVC encode, boasting the same extraordinarily gaudy and flamboyant colors seen in its 2D counterpart. In spite of the dark glasses, the vibrant palette practically hypnotizes viewers into this world of bizarre artificial cities and gorgeous woodlands. Primaries appear especially luxurious and richly saturated, but without ever becoming a distraction. The softer pastel hues of the forests and treetops are equally dramatic and striking, making much of the animation come alive with realism. The 1.85:1 frame also exhibits a vivid and very bright contrast, compensating for our sunglasses but adding to the dynamic energy and the natural three-dimensional feel of the computer-generated images. Blacks provide an inky intensity that penetrates deep into the screen with marvelously sharp gradational differences in the grayscale. Overall definition and clarity, too, are razor-sharp and distinct, from the fur coats of the cute little bear-like creatures to individual threads on the clothing of the human characters. Most impressive are the fluffy, hair-like treetops which sway and move with astonishing realism while each detailed whisker in the Lorax's moustache seems to move individually. This digital-to-digital transfer of the animated film is simply astonishing and surprises from beginning to end. The additional dimension is immediately apparent, providing the presentation with a terrific layered appearance which makes the action pop off the screen even more. Gimmick effects abound in hilariously entertaining ways, often reaching beyond the confines of the screen and amusingly floating in midair. Separation of foreground objects is remarkable, as if characters move independently of the background and generate an appreciable pop-up-book feel in several areas. Depth is consistent and never fails to impress, but the real highlight of this video transfer is the final chase scene through the streets of Thneedville. Putting viewers in the first-person perspective, we weave and bob through traffic with a fluid movement that dizzying as well as exciting, feeling as if we're really part of the pursuit or skiing down a fake snow hill. Overall, the movie is a fun and fantastic thrill ride in Blu-ray 3D. 'The Lorax' continues making a big hubbub with this terrific, near-reference DTS-HD Master Audio soundtrack, which radiates with dramatic verve and fervor every time character break out into song. My one and only minor qualm is admittedly a matter of personal preference. Although the design offers plenty of good, strong rear activity, it never actually fills the room with an immersive, enveloping feel which pulls the listener into the magical visuals. The discrete effects employed in the surrounds basically come off artificial and somewhat gimmicky, albeit pretty fun when heard in the moment. And still, that's the only issue worth noting. Where this otherwise wonderful lossless mix truly shines is in the front soundstage, creating an amazingly attractive and energetic wall of sound which seems consistent from beginning to end. With a sharp, crystal-clear mid-range providing tons of detailed clarity in the upper frequencies, objects zigzag across the screen from one channel to the next with remarkable, fluid panning. The original score of John Powell and the pop musical songs take advantage with outstanding differentiation of the various instruments and performers. While providing a nice weighty punch to the few actions sequences, bass has a natural, accurate sensation which benefits the music best. This is most apparent when the young Once-ler first breaks out into song and a guitar solo, hearing every note and pluck of the string. Meanwhile, dialogue and vocals are never overwhelmed or drowned out, making this an amazing, musical soundtrack for all to enjoy. Same bonuses are shared with the day-and-date DVD release. Audio Commentary — Directors Chris Renaud and Kyle Balda discuss the many technical details surrounding the movie and its production. As expected from an animated feature, the focus of the conversation is on adapting Dr. Seuss's book and creating the overall look in relation to the story's themes. Although Balda spends much of the time in silence, except for a few remarks of agreement, there is a good deal to learn from the commentary, but it's also pretty bland and straightforward. Seuss to Screen (HD, 4 min) — Cast & crew interviews discuss Seuss's unique artwork and the work done for translating into CG animation. Once-ler's Wagon (HD) — An interactive game where players can pick an item from the Once-ler's wagon for woodland creatures to play with. Seuss It up! (SD, 10 min) — Only available on the DVD, this featurette is hosted by story artist Mark O'Hare, teaching a group of kids how to draw some of the characters seen in the movie. With a well-intentioned conservationist message that's delivered rather heavy-handedly, 'Dr. Seuss's The Lorax' is finally brought to the big screen with some middling but mostly amusing results. With the voice talents of Danny DeVito, Zac Efron, Ed Helms, Rob Riggle, and Betty White, the animation is not surprisingly dazzling and mesmerizing, but the overall moral could be lost in tale which ultimately goes against what it preaches. The film debuts on 3D Blu-ray with a reference quality video and audio presentation that will please everyone in the household. Bonus features are not exactly extensive, but there are plenty of interactive games to keep the kiddies endlessly occupied indoors rather than going outside to enjoy Mother Nature. Nonetheless, the package as a whole makes for good, wholesome entertainment for the entire family.